The Cave of the Patriarchs (Hebrew: מערת המכפלה, Me'arat HaMachpela, Trans. "Cave of the Double Tombs"), called by Muslims the Ibrahimi Mosque or Sanctuary of Abraham (Arabic: الحرم الإبراهيمي) is a burial chamber for the early biblical Patriarchs (Adam, Abraham, Isaac, and Jacob). The compound, located in the ancient city of Hebron, is the second holiest site for Jews (after the Temple Mount in Jerusalem) and is also venerated by Christians and Muslims who maintain that the site is the burial place of four biblical couples: (1) Adam and Eve; (2) Abraham and Sarah; (3) Isaac and Rebekah; (4) Jacob and Leah. According to Midrashic sources, the Cave of the Patriarchs also contains the head of Esau, and according to some Islamic sources it is also the tomb of Joseph. 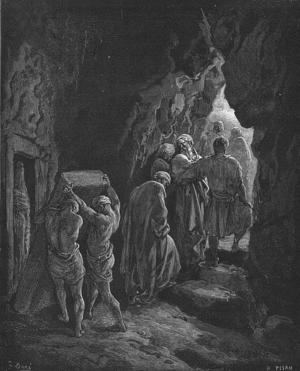 Painting by Gustave Doré depicting the burial of Sarah in the cave. According to the Book of Genesis, the biblical patriarch Abraham purchased the site from Ephron the Hittite as a family burial plot after the death of his wife Sarah. The Bible gives the sum Abraham paid for the cave as 400 silver shekels. The Book of Genesis refers to the cave as the cave of Machpelah, and elsewhere designates it as the cave of the field of the Machpelah, suggesting that the term Machpelah may actually be intended to describe the area in which the field containing the cave was located, near Mamre. Herod the Great built a large rectangular enclosure over the caves, the only fully surviving Herodian structure. Herod's building, with six-foot-thick stone walls made from stones that were at least three feet tall and sometimes a length of 24 feet, did not have a roof. Archæologists are not certain where the original entrance to the enclosure was located, or even if there was one. Until the era of the Byzantine Empire, the interior of the enclosure remained exposed to the sky. Under Byzantine rule, a simple basilica was constructed at the southeastern end, and the enclosure was roofed everywhere except at the center. In 614 C.E., the Persians conquered the area and destroyed the church, leaving only ruins; but in 637 C.E., the area came under the control of the Muslims, and the building was reconstructed as a roofed mosque. During the tenth century, an entrance was pierced through the northeastern wall, some way above the external ground level, and steps from the north and from the east were built up to it (one set of steps for entering, the other for leaving). A building known as the kalah (castle) was also constructed near the middle of the southwestern side; its purpose is unknown but one historic account claims that it marked the spot where Joseph was buried (Joseph's tomb), the area having been excavated by a muslim caliph, under the influence of a local tradition regarding Joseph's tomb. Some archaeologists believe that the original entrance to Herod's structure was in the location of the kalah, and that the northeastern entrance was created so that the kalah could be built by the former entrance. In 1100 C.E., the enclosure once again became a church, after the area was captured by the Crusaders, and Muslims were no longer permitted to enter; during this period the area was given a new gabled roof, clerestory windows, and vaulting. However, in 1188 C.E., Saladin conquered the area, reconverting the enclosure to a mosque, but allowing Christians to continue worshipping there. Saladin also added a minaret at each corner—two of which still survive—and the minbar. In the late fourteenth century, under the Mamluks, two additional entrances were pierced into the western end of the southwestern side, and the kalah was extended upwards to the level of the rest of the enclosure; a cenotaph in memory of Joseph was created in the upper level of the kalah, so that visitors to the enclosure would not need to leave and travel round the outside just to pay respects. The Mamluks also built the northwestern staircase and the six cenotaphs (for Isaac, Rebekah, Jacob, Leah, Abraham, and Sarah, respectively), distributed evenly throughout the enclosure. The Mamluks forbade Jews from entering the site, only allowing them as close as the fifth step on a staircase at the southeast, but after some time this was increased to the seventh step. Currently, the Tomb of the Patriarchs is oriented on a northwest-southeast axis, and is divided into two sections by a wall running between the northwestern three-fifths, and the southeastern two-fifths. The northwestern section is roofed on three sides, the central area and northeastern side being open to the sky; the southeastern section is fully roofed, the roof being supported by four columns evenly distributed through the section. In the northwestern section are four cenotaphs, each housed in a separate octagonal room, those dedicated to Jacob and Leah being on the northwest, and those to Abraham and Sarah on the southeast. A corridor runs between the cenotaphs on the northwest, and another between those on the southeast. A third corridor runs the length of the southwestern side, through which access to the cenotaphs, and to the southeastern section, can be gained. An entrance to the enclosure exists on the southwestern side, entering this third corridor; a mosque outside this entrance must be passed through to gain access. At the center of the northeastern side, there is another entrance, which enters the roofed area on the southeastern side of the northwestern section, and through which access can also be gained to the southeastern (fully roofed) section. This entrance is approached on the outside by a corridor which leads from a long staircase running most of the length of the northwestern side. 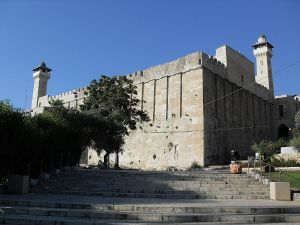 The southeastern section, which functions primarily as a mosque, contains two cenotaphs, symmetrically placed, near the center, dedicated to Isaac and Rebekah. Between them, in the southeastern wall, is a mihrab. The cenotaphs have a distinctive red and white horizontal striped pattern to their stonework, but are usually covered by decorative cloth. Under the present arrangements, Jews are restricted to entering by the southwestern side, and limited to the southwestern corridor and the corridors which run between the cenotaphs, while Muslims may only enter by the northeastern side, and are restricted to the remainder of the enclosure. The more visible known entrance to the caves. The caves under the enclosure are not themselves generally accessible (the waqf a traditional "trust" holding land for Islamic religious purposes); they have historically prevented access to the actual tombs out of respect for the dead. Only two entrances are known to exist, the most visible of which is located to the immediate southeast of Abraham's cenotaph on the inside of the southeastern section. This entrance is a narrow shaft covered by a decorative grate, which itself is covered by an elaborate dome. The other entrance is located to the southeast, near the minbar, and is sealed by a large stone, and usually covered by prayer mats; this is very close to the location of the seventh step on the outside of the enclosure, beyond which the Mamelukes forbade Jews from approaching. When the enclosure was controlled by crusaders, access was occasionally possible. One account, by Rabbi Benjamin of Tudela dating from 1163 C.E., states that after passing through an iron door, and descending, the caves would be encountered. According to Benjamin of Tudela, there was a sequence of three caves, the first two of which were empty; in the third cave were six tombs, arranged to be opposite to one another. These caves had only been rediscovered in 1119 C.E., by a monk named Arnoul, who had noticed a draught in the area near where the minbar is at present, and had removed the flagstones and found a room lined with Herodian masonry. Arnoul, still searching for the source of the draught, hammered on the cave walls until he heard a hollow sound, pulled down the masonry in that area, and discovered a narrow passage. The narrow passage, which subsequently became known as the serdab (Arabic for passage), was similarly lined with masonry, but partly blocked up; having unblocked the passage Arnoul discovered a large round room with plastered walls. In the floor of the room he found a square stone slightly different from the others, and upon removing it found the first of the caves. The caves were filled with dust, and after removing the dust, Arnoul found bones; believing the bones to be those of the Biblical Patriarchs, Arnoul washed them in wine, and stacked them neatly. Arnoul carved inscriptions into the caves describing whose bones he believed them to be. This passage to the caves was sealed at some time after Saladin had recaptured the area, though the roof of the circular room was pierced, and a decorative grate was placed over it. In 1967, after the Six Day War, the area fell into the hands of the Israeli Defence Force, and Moshe Dayan, the Defence Minister, and an amateur archaeologist, attempted to regain access to the tombs. Dayan, not knowing about the serdab entrance, started investigating the shaft visible beyond the decorative grate, and came up with the idea of sending someone thin enough through the shaft and down into the chamber below. Dayan eventually found a slim girl named Michal and sent her into the chamber. Michal explored the round chamber, but failed to spot the stone in the floor that led to the caves; Michal did however explore the passage and find steps leading up to the surface, though the exit was blocked by a large stone (this is the entrance near the minbar). According to the report of her findings, which Michal gave to Dayan after having been lifted back through the shaft, there are 16 steps leading down into the passage, which is 1 cubit wide, 17.37 m and 1 m high. 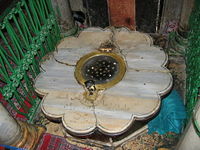 In the round chamber, which is 12 m below the entrance to the shaft, there are three stone slabs, the middle one of which contains a partial inscription of Sura 2, verse 255, from the Holy Qu'ran. Both Judaism and Islam agree that entombed within the Tomb of the Patriarchs are Abraham, Isaac, and Jacob as well as three matriarchs (Sarah, Rebekah, and Leah), and also Adam and Eve. Jacob and Leah - Jacob's other wife, Rachel, being buried near Bethlehem according to tradition. According to the midrash, the Patriarchs were buried in the cave because the cave is the threshold to the Garden of Eden. The Patriarchs are said not to be dead but "sleeping." They rise to beg mercy for their children throughout the generations. According to the Zohar, this tomb is the gateway through which souls enter into Gan Eden—heaven. There is a Jewish tradition that praying at the Tomb will bring good fortune in finding a proper spouse. There are Hebrew prayers of supplication for marriage on the walls of the Sarah cenotaph. The enclosure is known to Muslims as the Ibrahimi Mosque, as Abraham is a revered prophet of Islam who, according to the Qur'an, built the Kaaba in Mecca with his son Ishmael. After the conquest of the city by Umar the Herodian enclosure was rebuilt as a mosque for this reason, and placed under the control of a waqf—a traditional "trust" holding land for Islamic religious purposes. The waqf continues to control and maintain most of the site. ↑ However, some Christians maintain a tradition that the skull of Adam, is buried under Golgotha. ↑ Book of Genesis, 22:17-18: "So Ephron's field in Machpelah near Mamre—both the field and the cave in it, and all the trees within the borders of the field—was deeded to Abraham as his property in the presence of all the Hittites who had come to the gate of the city." However, the Hittite empire did not extend into Canaan until the late fourteenth century B.C.E., just before The Exodus in traditional chronologies, (which the Bible places many generations after Abraham). In the nineteenth century B.C.E., or twenty-first century B.C.E., the common dates for Abraham, Hittites barely existed as a distinct people. It is possible, however, that Hittite, in this case, does not refer to the distinct national group. The Hebrew word can also be rendered Son of Heth and so could refer only to Heth's children and/or grandchildren. ↑ 4.0 4.1 4.2 4.3 4.4 4.5 4.6 4.7 4.8 Biblical Archaeology Review, Patriarchal Burial Site Explored for First Time in 700 Years (May/June 1985). ↑ The Zohar, Verse 127. Tombs of the Patriarchs Article and Photos Sacred Destinations. History of "Cave of the Patriarchs"
This page was last modified on 19 January 2017, at 16:36.